You can tell if that's the case if the duplicate contacts appear in different colors since each address book can appear in a different color. For example, if you are syncing with Twitter, a card for each of your Twitter connections will sync to BusyContacts. Those Twitter cards will appear in addition to any cards you may have already created on your primary address book (e.g. iCloud, Google or Exchange). To solve this, BusyContacts allows you to link related cards to each other and combine them into a single virtual card. 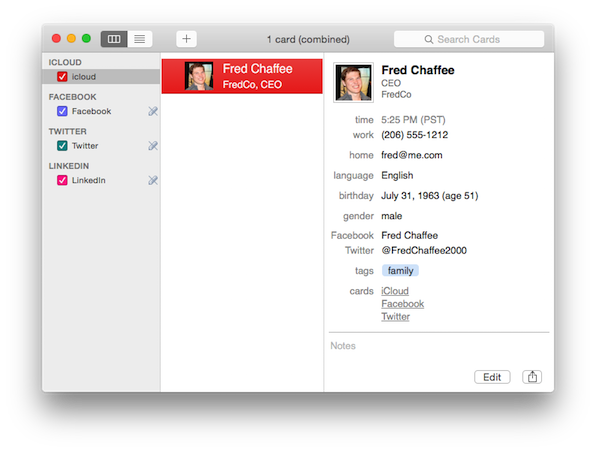 BusyContacts automatically links related cards that share common traits, such as the same name or email address. And you can manually link cards as well. Linked cards from multiple sources can be viewed as a single virtual card when in Combined mode by selecting View > Combine Linked Cards. 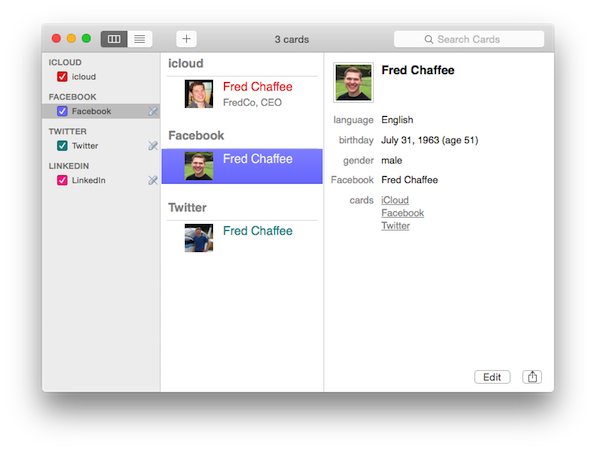 For example, when in non-combined mode, three linked cards appear for Fred Chaffee — one each on iCloud, Facebook and Twitter. When in Combined Mode, the three linked cards are merged into a single virtual card that displays all of the combined info from each of the individual cards. If you have duplicate cards that are not linked, you can link them by selecting a pair of duplicate cards and merging them (if they are on the same address book) or linking them (if they are on different address books). For more info see Linking and Merging Cards. BusyContacts does not have a Find Duplicates feature but Apple Contacts does, so you could try using it since BusyContacts and Apple Contacts sync with each other. 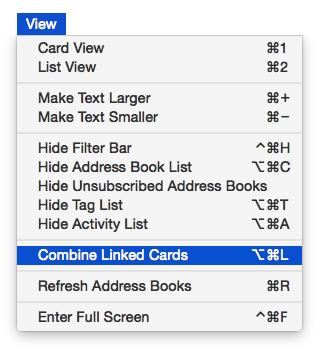 You'll find it in Apple Contacts by selecting Card > Look for Duplicates.